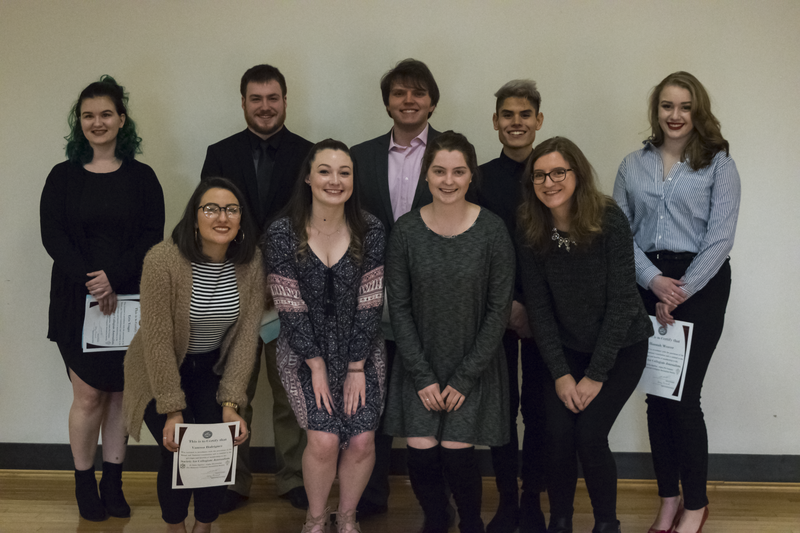 Congratulations to the newest members of our Marywood University chapter! 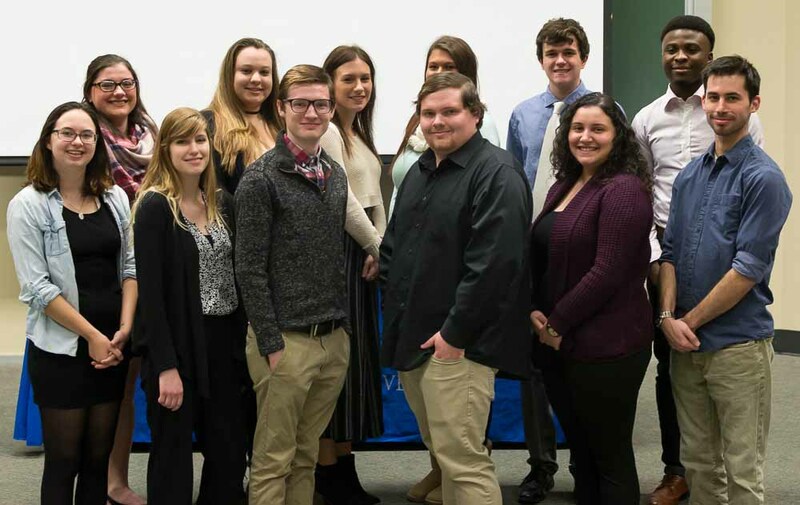 The Marywood chapter inducted nine new members on January 26. Front Row L to R: Vanessa Rodriguez, Kirstin Wilson, Lauryn Butler, and Carolyn Warcup. Back Row L to R: Erin Yeager, Dylan Wright, Nicolo Manzo, Manfid Duran, and Hannah Weaver. Chapter President Brooke Williams and Chapter Vice President Jessica Bonnaci, led the ceremony. Julie Sidoni was keynote speaker. Ms. Sidoni is a 16-year veteran of WNEP-TV. She anchors the noon and 4 p.m. newscasts solo, and the 5 p.m. newscast alongside co-anchor Jon Meyer. She is also responsible for the station’s Healthwatch 16 reports. She started her career in news as a reporter and host at WDUQ-FM, the National Public Radio station in Pittsburgh. She then worked part-time as an associate producer at WTAE-TV in Pittsburgh before landing her first on-air reporting job at WJAC-TV in Johnstown. She worked there for about a year and a half before finding her way to WNEP. She has won a Pennsylvania Association of Broadcasters award, and in 2017, was nominated for an Emmy Award. New inductees and current members of the Marywood SCJ Chapter. Julie Sidoni, WNEP-TV, offers the keynote address. Marywood SCJ Chapter leaders: Anne Zukowski, Brooke Williams, Bethany Wade, and Jessica Bonacci. 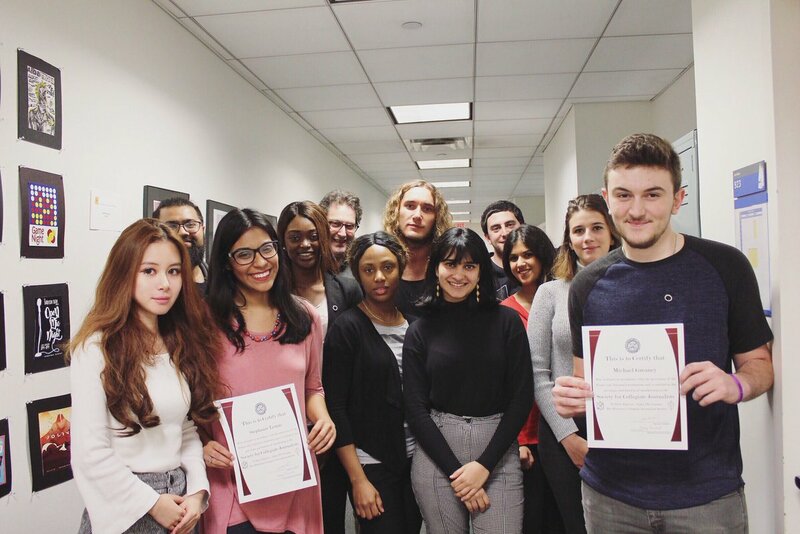 Congratulations to our New York Institute of Technology (NYIT) chapter members on their recent induction ceremony. They inducted 10 new members on Dec. 5. Special thanks to chapter adviser Larry Jaffee for this photo submission. Jody-Ann Simpson, Kimberly Obi, Stephanie Lemus, Michael Greaney, Matt Santamaria, Lee Guilhot, Pierre Landru, Wennie Wen, Deval Mistry, Clara Mamou, Chapter Adviser Larry Jaffee. 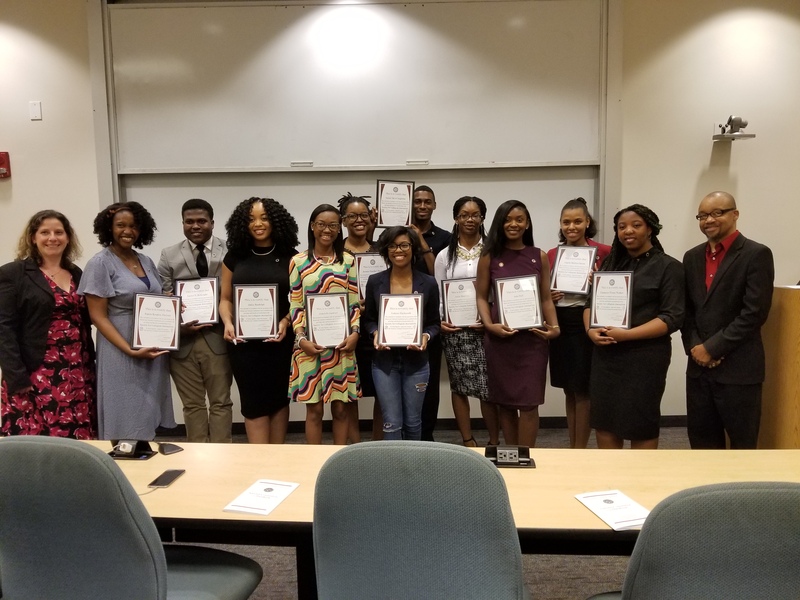 Congratulations to our Youngstown State University chapter members on their recent induction ceremony. 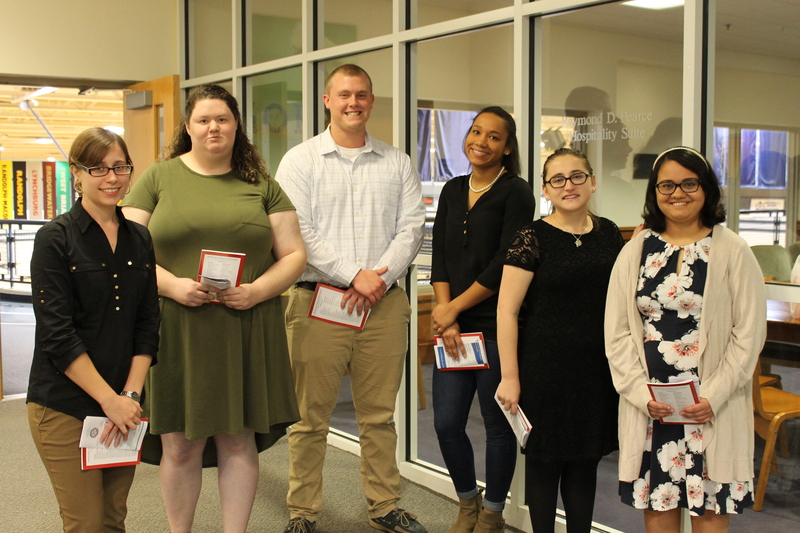 On Nov. 30, they inducted 12 new members. Longtime SCJ member and adviser Dr. Mary Beth Earnheardt spoke to the group in a meaningful — and fun — ceremony. Special thanks to Dave Davis for this photo submission. The Society for Collegiate Journalists National Office would like to extend congratulations to SCJ adviser Dr. Lisa Lyon Payne, Virginia Wesleyan University, on her new appointment as editor of College Media Review, the flagship publication of College Media Association. Lyon Payne has been advising the Virginia Wesleyan University SCJ chapter since 2011. Payne obtained her doctorate from the University of Georgia’s Grady College of Journalism and Mass Communication and taught as an assistant professor of communication at Kennesaw State University in Georgia. In addition to her teaching experience, Lyon Payne has worked as a public relations consultant, research analyst, editorial assistant and writer. We wish her the best in her new role! Lyon Payne (back row center) with her j-students at the CMA Dallas Convention in Fall 2017. Lyon Payne (second from right) with her j-students at the CMA Dallas Convention in Fall 2017.